Yesterdays weather was just awful, we had snow in the morning and sleet and rain in the afternoon, a really messy day. So I decided to head into the workshop and make me a portable potting bench. It’s basically a table top version of the bigger version we have in the polytunnel. 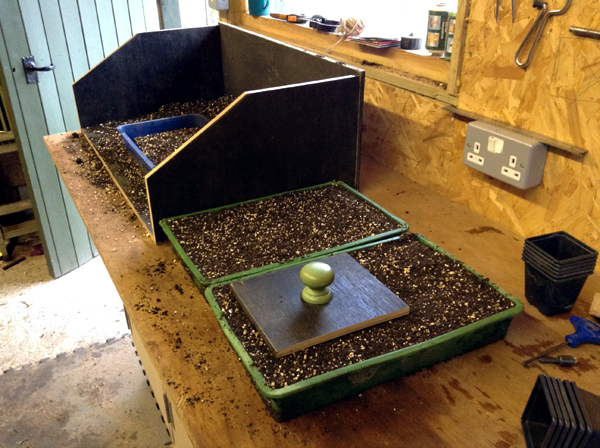 It holds enough compost to fill about 3 trays at a time, or up to 15 small pots. The design is fairly standard made from two identical Side Pieces, a Back and a Bottom all cut from a sheet of ply we had left over from the house build. Start by laying out the plywood on a flat surface and cut out one of the Side pieces. Then when you have the first one cut, trace an outline for the other Side piece onto the plywood. 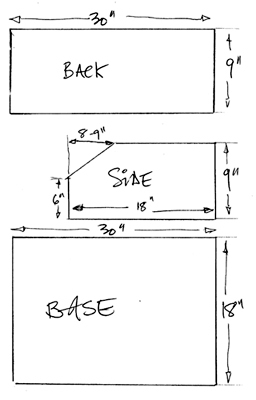 The important thing is to make sure the cut lines are nice and square, otherwise the back and bottom won’t fit so well, so use a Carpenters square if you have one. Take the sandpaper and smooth off the edges, or you’ll pick up some nasty splinters. Then measure and cut the base to size and again sand off any sharp edges. Now fix the sides to the base using some screws. You could use pins, or nails but it won’t last as long. Position the sides and back onto a piece plywood large enough for the bottom and mark and cut to size. Screw the back to the sides and you’re done! You can also add a little handle and fix it to the back for carrying it around. Finally give the whole thing a smooth with the sandpaper and you have a neat little portable potting bench! Whole thing took about an hour to make and have to say it looks alright and works really well at keeping the compost together. As soon as it was finished I just couldn’t wait any longer, I just had to put it to use and plant a few seeds. I know it’s early but every year I wish I’d sown my slow growing seeds earlier so I’ve made my first sowing of Celeriac, Thyme, Leeks, Peppers and Kohl Rabi. I plan to raise the Kohl Rabi in the polytunnel for some early crops. My seed mix is typically 50/50 John Innes Seed Compost and Vermiculite. I use a fair bit of Vermiculite in my compost mix to avoid the seedlings from damping off. While I had the tools out I also made a small tamper out of a scrap piece of plywood and an old cupboard handle. 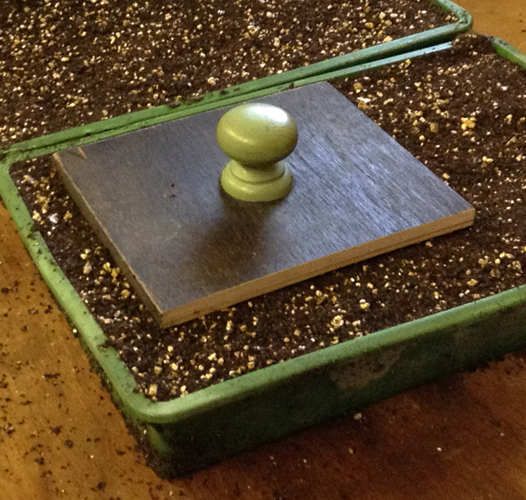 I sprinkle fine seeds on the top of the compost and gently firm them in with a little pressure on the tamper. There you have it, a very handy little potting bench which I’m sure will get a lot more use this year!